Thanks in part to a decades-long relationship developed and strengthened through an interagency agreement (IAC) between the Texas Department of Transportation’s (TxDOT’s) Houston District and Texas A&M Transportation Institute (TTI) researchers, 1,000 miles of Houston roadways are monitored by a low-cost traffic data collection system. The system collects the average speeds and travel times of motorists using an anonymous wireless address matching (AWAM) system, invented by TTI researchers, to facilitate traffic flow in Houston and the surrounding region. The monitoring system anonymously reads Bluetooth® and Wi-Fi enabled wireless devices such as cell phones and vehicle navigation systems as vehicles pass AWAM antennas strategically placed along the roadside. The data is transmitted in real time to transportation and emergency management centers, like Houston’s TranStar, to determine how long it takes to traverse designated roadway segments and to help identify when and where congestion is forming. TranStar personnel can use the data provided to, for example, reroute traffic to avoid congestion before it ever occurs. AWAM was first implemented on I-45 between Houston and Dallas following the evacuation gridlock caused by the threat of Hurricane Rita in 2005. Motorists sat for hours in traffic jams along evaluation routes. With AWAM, TranStar personnel can monitor the congestion along I-45 and determine, for example, if and when contraflow lane reversals should be implemented. Based on the successful deployment on I-45, the TxDOT Houston District has recently updated its travel-time monitoring system to include a majority of AWAM-based sensors. AWAM has been used by TranStar since 2010, providing accurate and low-cost data for its traveler information system. “As a result of the cost savings we realized by using AWAM, we’ve been able to apply resources to monitor travel times in areas we were not able to consider before,” explains TxDOT’s David Fink, Houston TranStar transportation operations engineer. Like TTI’s effort in Houston, the Institute’s work in support of TxDOT’s I-35 Expansion Project in the Waco District is a prime example of how important interagency agreements are for Texans, especially considering the goals outlined by TxDOT for this particular project. “Working under two IACs, TxDOT had a remarkable, long-range strategic vision for turning 17 separate construction projects covering almost 100 miles from Salado to Hillsboro into one modern, coordinated and cohesive work zone,” explains TTI Assistant Agency Director Christopher Poe. Poe says the IACs allowed TxDOT to use a broad range of skills from numerous employees across the Institute, including professional engineers, planners and safety experts. 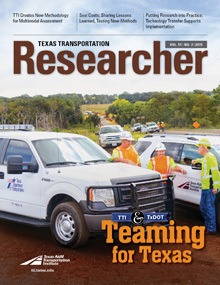 TxDOT has specifically cited having TTI personnel and their expertise as a way of supplementing the agency’s own staff as a major benefit of such agreements. Since the I-35 project began in 2010, the TxDOT-TTI partnership has developed and deployed advanced, work zone safety enhancements; an intelligent transportation system infrastructure that includes new methods and capabilities for distributing traveler information; and unparalleled coordination between the various contractors and law-enforcement agencies involved in the effort.